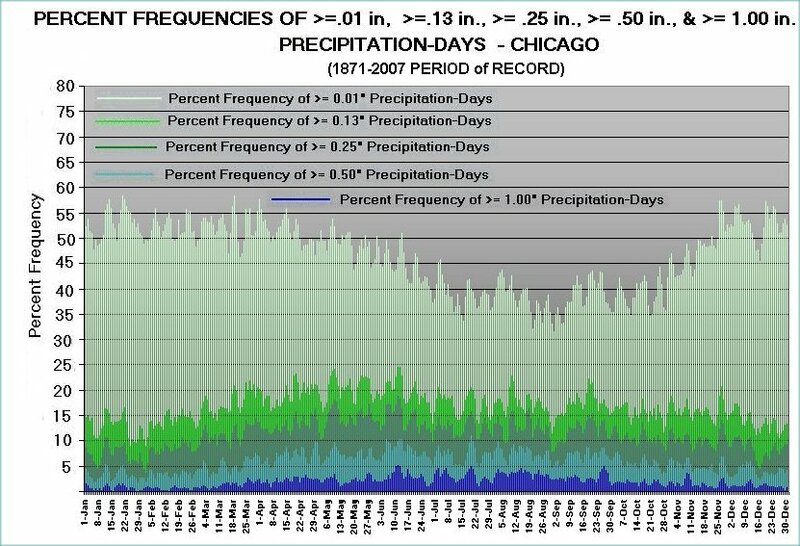 The following is a graphical climatology of Chicago, Illinois temperatures, precipitation, and snowfall, from the 1870’s at the earliest (temperature and precipitation) into 2019. The graphics consist of summary overview charts followed by year-to-year graphs that depict daily temperature, precipitation, and snowfall. The daily precipitation observations date from the start of 1871, temperatures from 10 June 1872, snowfall from the 1885-6 season, and snow depth from the beginning of 1901. “Official” observations from 1871 through June 1905 were taken at a number of sites in the downtown area, those from July 1905 through 1925 at the U. S. Court House, and from January 1926 through 20 June 1942 at the University of Chicago. On the latter date the official site transferred to Midway Airport, and on 16 January 1980 it moved to O’Hare International Airport, where it remains today (several within-site moves have been made at O’Hare). The data thus reflect observations made at multiple sites and exposures (for example, heights of the thermometers above ground-level) over the years, so interpretations and comparisons should be taken in this light. The top chart on a given yearly page (links below) displays “floating-bars” of the daily maxima and minima. Each bar represents an individual day’s temperature range. Superimposed are two line traces, the upper one connecting 1872 to present average daily maxima, the lower one 1872 to present average daily minima. The bars depict the varying diurnal, synoptic, long-wave, and seasonal influences on temperature over time, and subjectively, some years’ features can be quite interesting to look at (see “REPEAT LINKS TO SOME OF THE MORE INTERESTING YEAR-TO-YEAR GRAPHS, WITH ACCOMPANYING NOTES” section below). The second chart down shows the arithmetic departures of day-to-day mean temperatures less the corresponding 1872-present calendar-day average means. Vertical lines extending upward from the zero line indicate above average means for the day (colored red), those extending downward indicate below average daily means (colored blue). In the entire series, greatest positive departure for any given calendar day is +37 F on 20 March 2012, the greatest negative departure -45 F on 24 December 1983.. The third chart down shows the middle chart’s departures in deseasonalized or “standardized” form. This adjusts for the fact that individual calendar days have higher or lower inherent year-to-year variability in mean temperature (and departures). Standardized anomalies are calculated by dividing the arithmetic anomaly by the climatological mean temperature standard deviation for the calendar day in question, creating “z-scores”. Into 2017, the most positive z-score is +3.7 for 20 March 2012, the most negative, –3.6 for 13 February 1905 and 24 December 1983. The fourth chart down depicts daily rainfall, the fifth and sixth charts, respectively, daily snowfall and snow depths. 1871 – Prelude to Great Fire of 8-10 October, just 3.70” precipitation between 4 July and 8 October, 35% of average and driest such calendar period in all history down to present. 1872 – Minus 23 on 24 December, coldest December temperature in Chicago until –25 F in 1983 (also on 24th). 1875 – Coldest year in all Chicago history down to present, also coolest Summer (June-August) and Fall (September-November). 1877-78 – “Year Without a Winter” – Warmest winter (December-February) in all Chicago history down to present by 1.5 F, and warmest December-March by nearly 3 F.
1879-80 – Great gyrating warm and cold spells from late-September through year-end 1879. January 1880 the warmest in Chicago history down to the present day (by more than 3 F). 1891 – Cool Summer followed by much above normal September, warmest calendar month of the year. Only such September in entire Chicago climatic history of this distinction. 1892 – Thirteen out of fourteen consecutive days with measurable rainfall in June. Wettest June (10.58”) in Chicago history. 1895 – Long cold spell over late January to early February. 1896 – Snowiest February in Chicago history (27.8”), but very forward April and May 1899 – February cold wave drops mercury to –21 F on 9th. 1903-04 – Coldest winter (December-February) in all Chicago history down to present. 1910 – Warmest March on record on Chicago until 1945. 1911– Three-day run of 100 F or higher daily maxima in early July – all time-record for Chicago; but unusual (for mid-Summer) turn to much cooler than normal later in month. 1913 – Persistent above normal warmth over November and December. 1915 – Warmest April on record up to this time; but May 2 F colder than April. Second coolest Summer (June-August) in all Chicago climatic history. 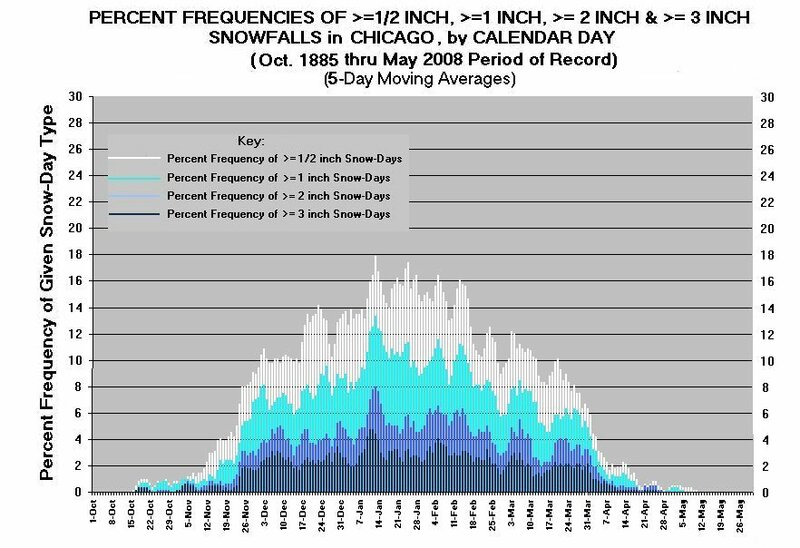 1918 – 42.5” snow in January, most ever for single calendar month in Chicago history. Snow depth 25” on 13 January, deepest on record until 1967. 1920-21 – Most snow-free winter in all Chicago history (9.8” total). 1921 – Warmest year in Chicago history. 1925 – Coldest October in Chicago history. 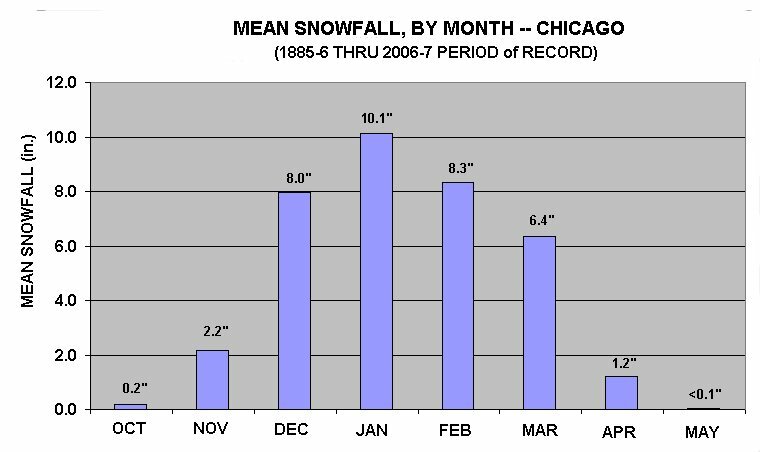 1926 – Snowiest March on record in Chicago (23.6”), most of it received near month-end; 10-inch snow depth on 3 April. 1927 – Following a cool Summer, quasi-periodic much above normal temperature spells in September, October, & November. 1930– 90 F on 10-11 April, earliest 90 F daily maxima ever recorded in Chicago; 75 F on 19 November, warmest ever so late in season. 1931 – Second warmest year in Chicago history, warmest Fall (September-November). 1931-32 – Following an almost complete absence of below normal temperatures over November to February, unseasonable cold sets in during March, coldest month of the ’31-’32 winter season by nearly 3 F.
1934 – 102 F on 31 May; 105 F on 24 July (highest ever recorded at Chicago ‘official’ station). 1936 – Long cold siege from late January through most of February. Hot early July – 102 F on 10th. 1938 – 13.6” total snowfall for April (snowiest in history). 1940 – Snowiest November (14.8”) in Chicago history. 1947 – Wettest April (8.33”) and warmest August in all Chicago history down to present. 1950 – 67 F on 25 January, highest ever in calendar month January. Also 84 F on Halloween and 81 F on 1 November, but –1 F and –2 F on 23-24 November, respectively, earliest subzero readings in Chicago history. 1951 – Snowiest December (33.3”) in Chicago history down to present. 1953 – Quasi-periodic much above normal temperature spells over late-August through mid-November: 101 F on 1-2 September, 99 F on 29 September, 87 F on both 21-22 October, and 71 to 74 F readings over November 15th to 19th, inclusive. 1954– Eleven-day run of 90 or higher daily maxima in June. More than 12” rain in October (wettest October in Chicago history. 1955 – Warmest summer (June-August) in all Chicago history down to present; also warmest calendar month (July: 81.3 F). April also warmest in Chicago climatic history. 1960 – Coldest March in all Chicago history down to present by more than 3 ½ F. 1961 – More than 14” rain in September. 1962 – Driest year (22.22”) in Chicago history down to present. 1963 – Coldest January since 1912, warmest October in all Chicago history down to present. 1967 – Great 23-inch snowstorm over 26-27 January; 27-inch snow depth in early February. 1974 – 80 F on 3 March, earliest 80 F degree temperature ever recorded in Chicago. 1976 – 75 F on 27 February, highest ever so early in season in Chicago. 1976-77 – Great thermal anomaly “flip-flop” between successive four-month periods: October-January coldest such period on record, February-May the warmest on record. January coldest calendar month in Chicago history (10.1 F). 1977-78 – Snowiest season in Chicago history up to this time (85.3”). 1978-79 – Heaviest snow season record broken for Chicago (89.7”) after just one year. Ninety-eight consecutive days with measurable snow cover (27 Nov to 4 Mar). Record all-time snow depth on 14 Jan (29 inches). 1979 – September driest calendar month in Chicago history (0.01”). 1982 – Minus 26 on 10 January; Minus 25 on 16 January. Wettest December (8.56”) in Chicago history; 71 F on 2 December. 1983– Great El Nino year. Wettest calendar year in Chicago history (49.35”) up to this point. Coldest December, -25 F on 24th. 1985 – Coldest year since 1917. Minus 27 recorded on 20 January – coldest temperature in all Chicago history down to present. Wettest November (8.22”) in Chicago history. 1986 – 88 F on 29 March, highest ever so early in season in Chicago. 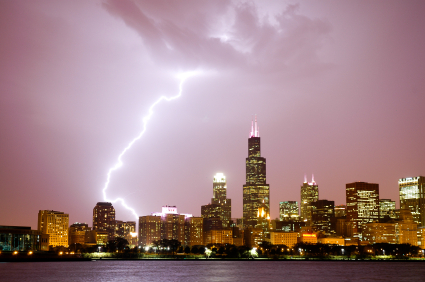 1987 – August wettest calendar month in Chicago history (17.10”). 1988 – 104 F on 20 June, 103 F on 25 June, but coldest October since 1925. 1989 – 6.3” snow in October, cold December. 1992 – 33 F on 27-28 May, 38 F on 21 June – all coolest so late in season marks. Coolest Summer (June-August) since 1915. 1993 – Coolest September in Chicago on record. 1995 – Second warmest summer (76.3 F) on record (to 1955’s 76.4 F); 104 F on 13 July. But 32 F on 22 September, earliest 32 F or lower temperature on record. 1998– The other great El Nino year of the 20th century. Warmest year in Chicago since 1931. 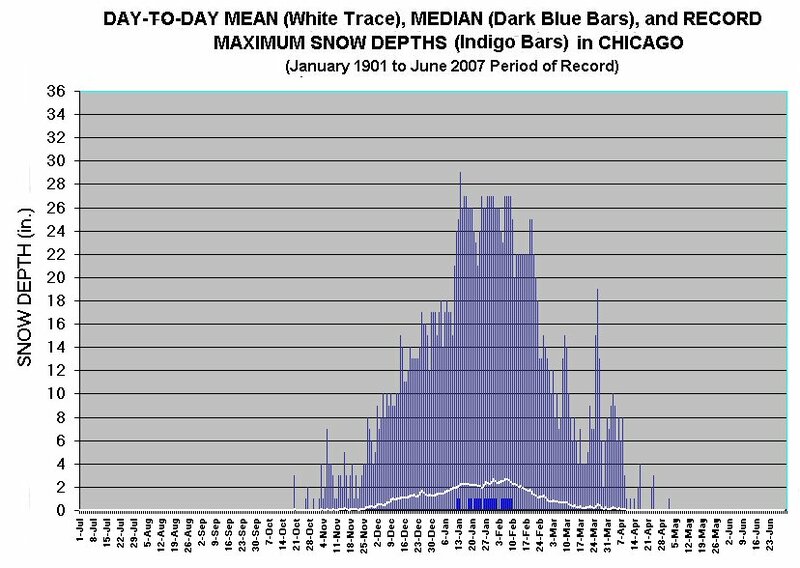 1999 – 18.6” snow on 2 January, all-time Chicago heavy snow record for individual calendar day; 70 F on 11 February. 2000 – Exceptionally mild late February to early March: 72 F on 25 Feb, 78 F on 6 and 7 March. Second coldest December in Chicago history. 2005 – Driest calendar year in Chicago (24.09”) since 1962 (22.22”). 2006 – Mildest January in Chicago since 1933. 2008 – Wettest calendar year in Chicago history (50.86”).